This week, we chat with Juliet from the Theatre Costume Shop aka Adelaide Costume Hire HQ, about dressing up. This week, the SA Drink Of The Week is a Black Chook Sparkling Shiraz. In 100 Weeks Ago we hear a snippet from our chat with Rachel Hannaford and Sasha Sachs from the Fig Tree Restaurant on KI about fantasy. In IS IT NEWS, Nigel challenges us on stories about costumes. And in the musical pilgrimage … Todd will share a brand new song from Paula Standing. How do you care for Chewbacca? Black Chook Sparkling Shiraz McLaren Vale … tasting notes. The government came out immediately, saying it would cost too to do extra water filtration, etc. What is the right course of action? 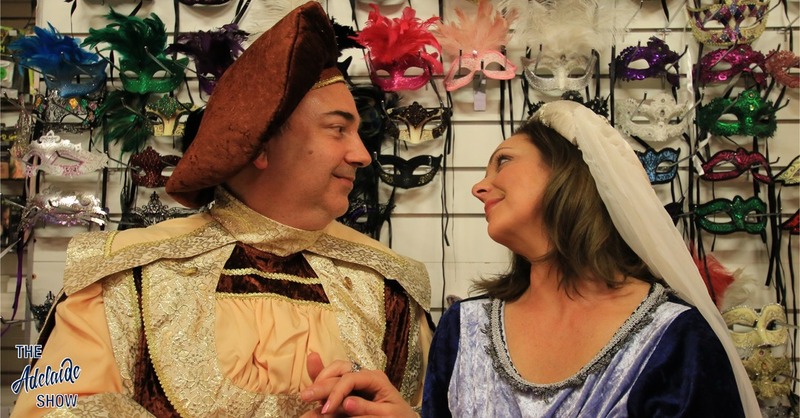 To be or not to be, interviewing Juliet from the Theatre Costume Shop, that is the question. And, of course, the answer is that we are interviewing her in the hope we can peer behind the rows of costumes and try to understand why becoming someone or something else can help us drop our inhibitions and open up our fun centre. Juliet, of all the costumes in your shop, which is the one you like the most for yourself? Are their clear favourites for men, women, boys, girls, couples, etc? What drives you to run a costume shop? Does your business have peaks and troughs, like florists and some other retailers? Are you happy that Halloween is becoming more of a THING in Australia? In a College Times piece on dressing up for Halloween, there were a couple of quotes I’d like you to react to. 1. Psychology professor Sally Foster from the University of Miracosta in California questions an individual’s choice of their costume. In an interview with WCPO Cincinnati, she analyzed evil costumes, which are often popular during this time of the year. According to Foster, “Evil costumes allow people to safely and even creatively express their dark side without guilt.” Just because someone wears a “Scream” mask on Halloween does not necessarily mean they want to become a murderer themselves. Do you ever get spooked by some of the combinations people leave with? 2. Costumes also have more to do with their inner desires and fears. Dr. Carole Lieberman, a psychiatrist on the clinical faculty of UCLA’s Neuropsychiatric Institute states in Psychology Today that “by dressing up as the things they are most scared of, [some]people try to feel as though they have mastered their fears.” Can you imagine your shop being part of a therapy plan? In a Live Science article about cosplay, there was yet another take on choosing role play. Robin S. Rosenberg, a clinical psychologist at the University of California, San Francisco says when a cosplayer selects a particular costume, they are often tapping into a specific character — or combination of characters — because something about that role speaks to them personally. She noted two characters in particular to illustrate her point that cosplay is an extension of the way we all play different roles through the day and week. Wonder Woman: She is another enduring and popular choice that resonates with many women, partly because she holds her own in the male-dominated world of costumed comics superheroes. For those cosplayers, dressing as Wonder Woman is a way of celebrating and embracing her power, Rosenberg said. Now, getting down to some tin tacs. Body size. How do you stock enough of a range of particular characters to fit different shapes and, two, how do you guide a person when they are poised to select a costume that will NOT be flattering. What are some occasions to which we can wear costumes that we might not have thought about? What goes through you mind when you hear that I made my own zombie outfit? German prisoners at Torrens Island have volunteered to help make costumes for various pageants this year. Even though the war continues, many of this years festivities have been retained to help with morale. The idea came from the ladies of the CWA and Red Cross who have been helping with packages and letters to and from Germany. Mrs Agnes Kernow of the CWA has been organising spare cloth and materials for the prisoners who she says appreciate the opportunity to use their spare time in a constructive manner. The thirty eight German seamen, survivors from sunken transport vessels from German New Guinea will be held on Torrens Island Internment and quarantine facility until the war ends. An invitation to a fancy dress ball, a hurried acceptance and then, a week or less before the appointed date, you suddenly make a desperate effort to think of sometime original to wear, Pierrots and Pierrettes, Dutch Girls, Indian Squaws, and Cleopatra’s, all throng before the mind’s eye, but they have been represented at many dances before. Now is the time, if you would like to wear something really novel, to apply to the British Imperial Oil Company Limited, 83/89 Grenfell Street, Adelaide, where you will have the choice of three designs in Paper Fancy Costumes— the “Shell” Petrol Pump, “Pennant” Quart Can and the “Shell” Red Can. fashioning the frocks designed by Adelaide artists Jacqueline Hick and Marjorie Fisher. Animal costumes were made of sheepskin; 75 yards of book muslin were dyed, starched, and ironed for frilly ballet frocks. In 100 Weeks Ago, we hear a snippet from our chat with Rachel Hannaford and Sasha Sachs, from Hannaford And Sachs on Kangaroo Island. They run the now-famous Fig Tree Restaurant there, where people eat in natural “rooms’ within a huge fig tree. There really is a sense of wonder and fantasy about it. Juliet, are we losing our sense of wonder and fantasy? Can we get it back? Is Adelaide costume hire the answer? And our song this week is Pity Me by Paula Standing, selected by our musical curator, Todd Fischer. This week we have a track from Paula Standing’s new EP Good Heart. The song I’m going to play for you is called Pity Me which was released on November 17th with a launch at The Daniel O’Connell Hotel in North Adelaide. Paula’s music could be described as ‘folk with an old country twist’ and features soulful vocals and powerful stories of both ordinary and extraordinary people. She takes everyday experiences and turns them into delicious tales with a sting. There are overtones of influence from Joni Mitchell, Lucinda Williams and Gillian Welch throughout these haunting melodies and I really love the way this song starts off with the ominous distorted guitar and marching-style beat. TRANSCRIPTION: The following transcription has been produced using Dragon Professional Individual for Mac V6. Enjoy. And if you find some magnificent gibberish, please share on social media and tag us.